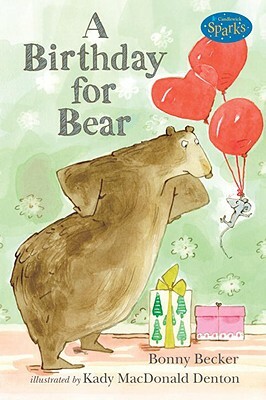 Can a relentlessly cheery Mouse wear down a party-pooping Bear? The unlikely pair are back in a droll, utterly charming tale that early readers will celebrate. Bear does not like birthdays. He doesn t like parties or balloons, cards or candles. In fact, Bear does not like anything to do with birthdays at all. He would much rather spend his birthday alone cleaning his house, but Mouse, small and gray and bright-eyed, has other ideas. The author and illustrator who created the best-selling picture book A VISITOR FOR BEAR return with another comedy about the curmudgeonly Bear and his eager friend Mouse, this time in an early-reader format. Bonny Becker is the author of a number of award-winning picture books and middle-grade novels. She lives in Seattle. Kady MacDonald Denton is the illustrator of TWO HOMES by Claire Masurel and A CHILD'S TREASURY OF NURSERY RHYMES. She lives in Peterborough, Ontario, Canada.